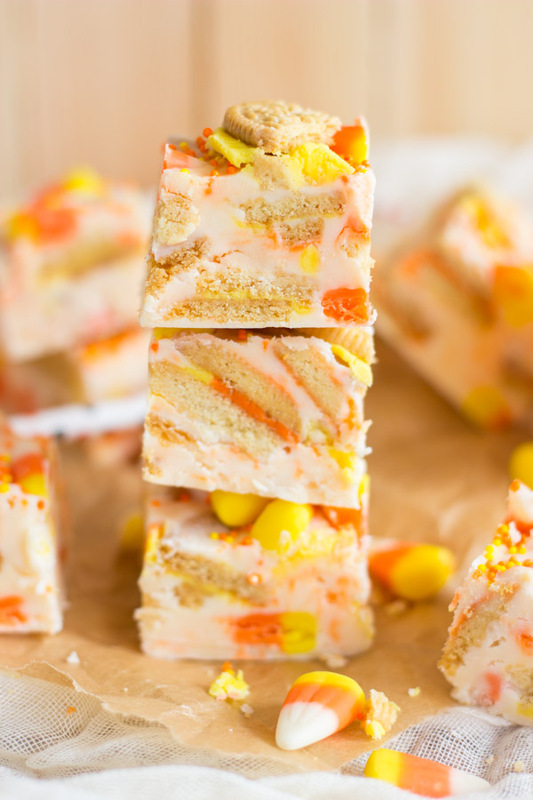 Made in the microwave with vanilla frosting, white chocolate chips, candy corn, and Candy Corn Oreo cookies, this super quick and easy fudge is a Halloween recipe for a true sweet-tooth! 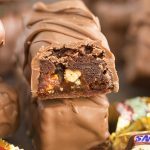 I swore to myself that I wouldn’t make yet another version of my favorite 10-minute (and sometimes only 5-minute) fudge recipe until next year – I’ve beaten you guys over the head with quick fudge recipes. I said I wouldn’t share one for a while, but I couldn’t help myself. That recipe is addictive. It always starts with the same base – a container of store-bought prepared frosting, and a bag of chocolate chips… white chocolate or otherwise. In this case, white chocolate. Oh, and butter. I’ve made a whole slew of these. My personal favorite is this 5-Minute Pina Colada Fudge, followed by this 5-Minute Biscoff Cinnamon Bun Fudge, and then I also love this 5-Minute Peanut Butter Cup Fudge because, duh, peanut butter. Also great: 10-minute-ish Lemon Cream Pie Fudge (love it), and a 5-Minute Strawberry Shortcake Fudge. 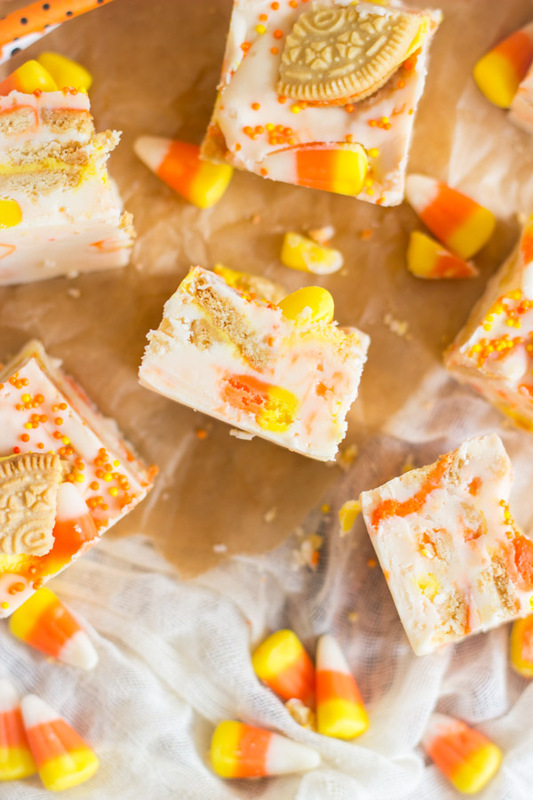 I planned to refrain from a fall version, but then I spotted Candy Corn Oreos at Target, and my brain formed the idea for this 10-Minute Candy Corn Fudge, with crushed up Candy Corn Oreos, and, well, actual candy corn. I use crushed cookies a lot in these quick fudge recipes, and I love the broken cookie pieces for texture. As a sandwich cookie with a delicious filling, Oreos are even better. I used Lemon Oreos in the Lemon Cream Pie Fudge, and it was amazing. 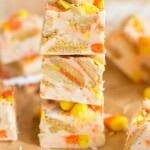 This 10-Minute Candy Corn Fudge requires about two minutes of microwaving, and that’s all the ‘cooking’ it takes. Stir in your add-ins, spread it in the pan, and let it set. Fudge in minutes. I used vanilla frosting and white chocolate chips for the base, but I also think cream cheese frosting would be really good. 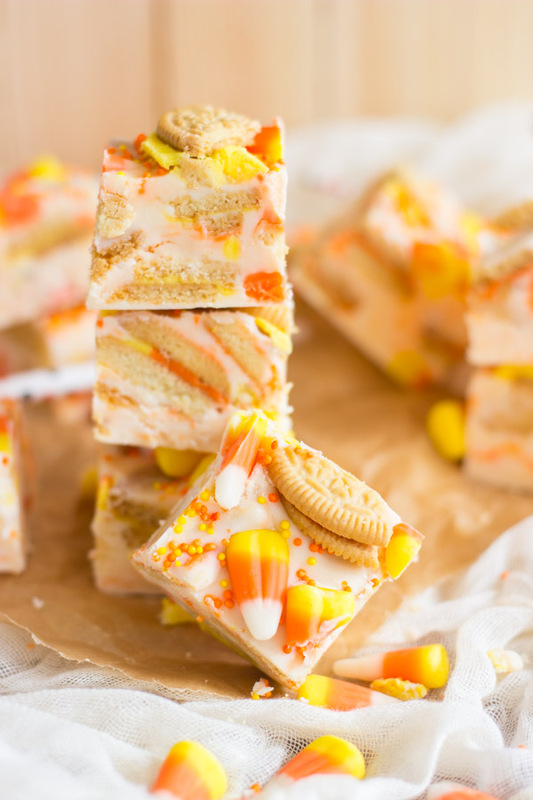 I mixed in a package of broken Candy Corn Oreos, and a bunch of candy corn. 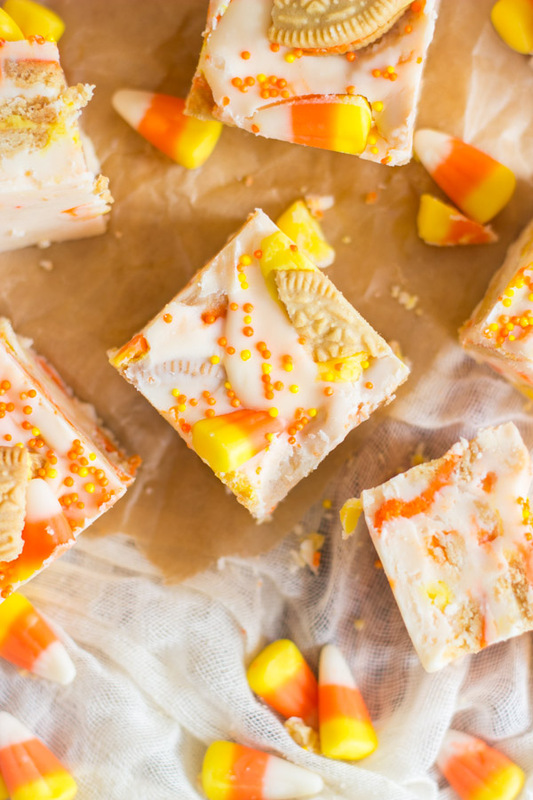 It’s an explosion of candy corn flavor! Very sweet, but I cut it into small pieces, and just a little bite was extremely satisfying. 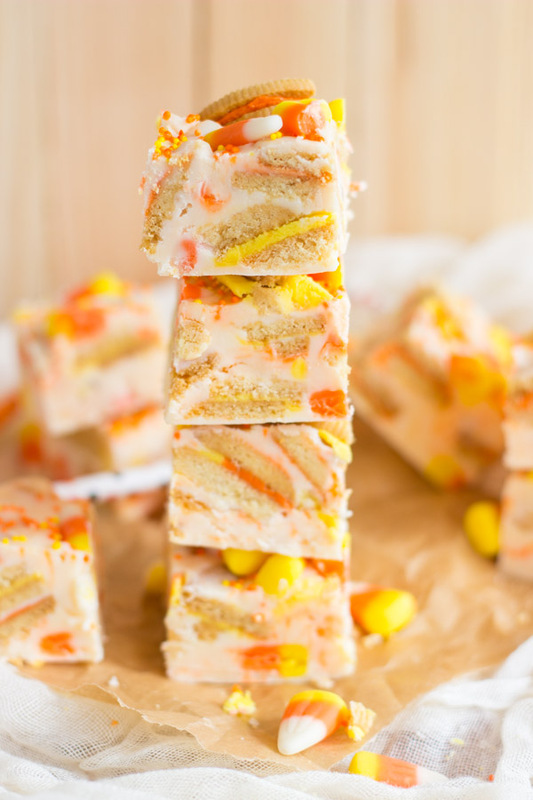 I served this 10-Minute Candy Corn Fudge to last minute guests that sought refuge at my house during Hurricane Matthew last weekend, and I had a happy crowd of kids. 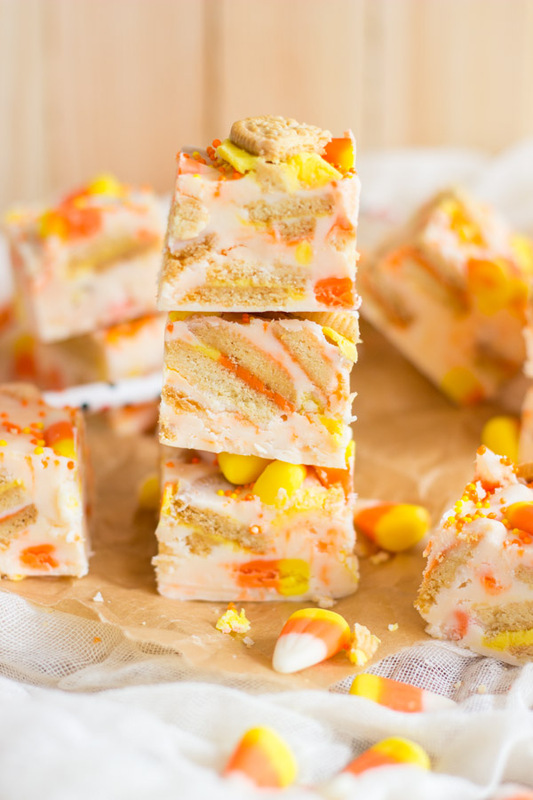 Made in the microwave with vanilla frosting, white chocolate chips, candy corn, and Candy Corn Oreo cookies, this super quick and easy fudge is a Halloween recipe for a true sweet-tooth. Line an 8-inch square pan with foil, extending it over the edges of the pan, and spray it with non-stick spray. 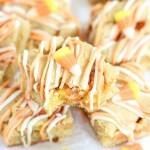 Fold in 2/3 c. candy corn and Candy Corn Oreo cookies. Pour into the prepared pan, and spread evenly. 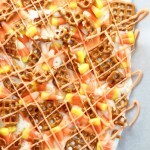 Sprinkle with remaining candy corn and sprinkles. Microwave fudge is THE BEST — you can never have too much. Pinned! Right?? It’s just so easy and versatile. I can’t stop with it! This is my kind of fudge! I love the extra goodies for texture — I’m big on crunch! And it starts with a can of frosting?! 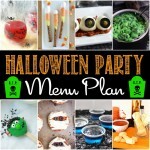 My kids would love helping with this! I can’t stop making it!! The recipe is so easy and versatile – it’s addictive. Yes, kids would totally have fun with this! Where in the world do you buy Candy Corn Oreo cookies? I usually find the Limited Edition flavors at Target and Walmart! I know they’re LE, but I think they come back each fall. How do you break up the Oreos? The filling keeps squeezing out for me. I was trying to use the orange filled ones for another recipe, and it was a disaster. 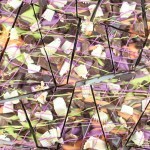 This fudge looks great, and I would really like to make it. Help? Hi Judi! I just chopped them roughly. The filling does squeeze out a little bit, but it didn’t destroy the fudge! It didn’t end up being a big deal. I just made sure that I folded in the Oreos quickly, and I really ‘folded’ them in, didn’t stir too aggressively. Alternatively, I wonder if you just threw the Oreos in the fridge for 20-30 minutes before chopping them – the filling would be nice and solid! I hope that helps! Would it still work without the cookies?